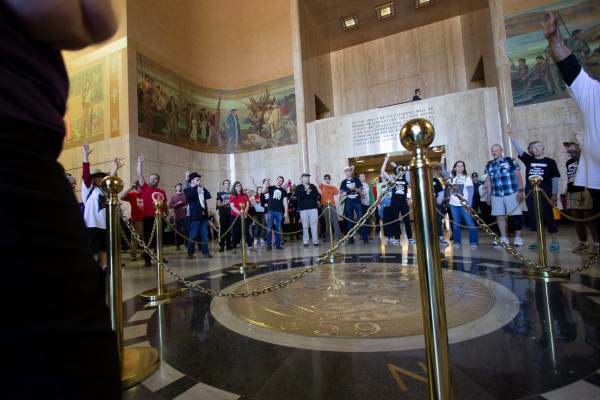 Communist groups from around Portland stormed the Oregon capitol building on Monday to protest Governor Kate Brown’s special legislative session. Brown called the special session to carve out a specific tax cut for sole proprietor owned businesses, whom she just raised taxes on last month. Many are calling Brown’s stunt out for what it is, a cheap way for her to claim she cut taxes while on the campaign trail for re-election. The commies, as you would guess, can’t stand to see government NOT taking 100% of what everyone else has, so they had to cry and moan. The protest started on the steps of the capitol, and included a bizarre skit of an actress Kate Brown colluding with an actor Phil Knight and a stereotypical real estate developer. The protest then moved inside, as the spoiled children chanted and created an overall ruckus, which, by the way, is illegal. Of course the Oregon State Police officers assigned to the capitol building stood around and did nothing, because, after all, they work for the communists who run the state government. 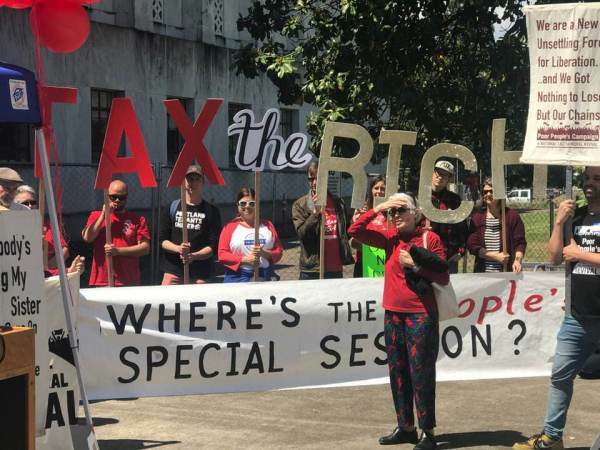 Portland DSA is teaming up with the Poor People’s Campaign to rally in Salem against a legislative special session that intends to cut taxes for the wealthy. In Oregon vital services have been chronically underfunded for years, and yet another tax break for the wealthy will make matters even worse. Where’s the special session for working and poor people? We demand a special session to tax the wealthy and corporations to fully fund housing, education, jobs and services for our immigrant and refugee communities. Join us Monday, May 21st, noon at the Capitol steps to tell our state officials loud and clear that the days of neo-liberal austerity and welfare for the wealthy are over. We demand they fund and support the working class! It’s time to TAX THE RICH!! As reported in The Oregonian (http://www.oregonlive.com/politics/index.ssf/2018/05/kate_browns_tax_plan_would_mos.html) this tax plan will mostly benefit high-income individuals making well over $200,000 a year. 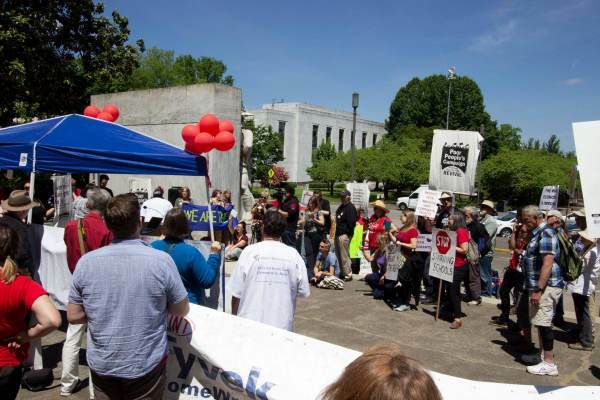 It would force working-class Oregonians to pay higher tax rates than their wealthy bosses. And it would take away critical revenue needed to fund schools, affordable housing and other vital services. Foster parent advocates, in the middle of dealing with the screaming communists across the street. 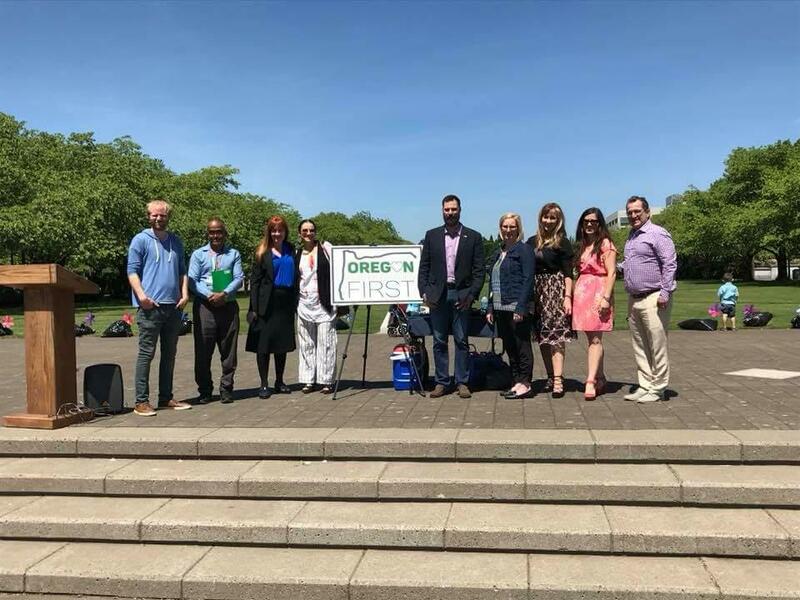 Lost in the shuffle was a separate event on the capitol campus, which was a rally to draw attention to the failures of Oregon’s foster care system, led by activist Ben West, state Senator Kim Thatcher, and education watchdog Kim Sordyl. As the foster parent advocates were singing the National Anthem, the communists across the street were shouting and screaming through their megaphones. On hand speaking for the communists was Greg McKelvey, suspected serial woman abuser, seen here speaking at the podium at the event. Four chapters of the Democratic Socialists of America are joining the Poor People’s Campaign to protest on the Capitol steps. 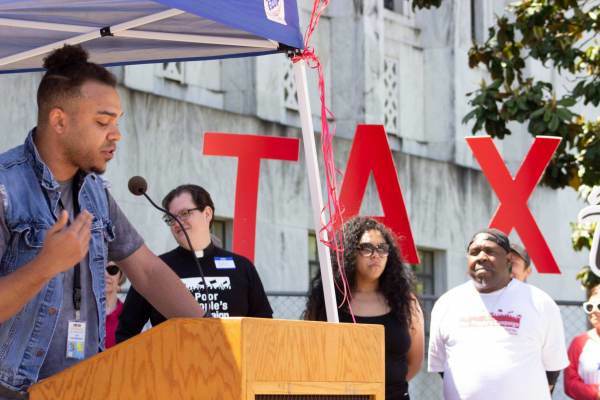 Those groups and their allies—including Multnomah County Democrats, Portland Association of Teachers, Jobs With Justice, Pineros y Campesinos Unidos del Noroeste (PCUN), Portland’s Resistance, and Portland Tenants United—are unhappy about the governor’s plan to extend an existing tax break for small businesses to some sole proprietorships.